Police are investigating an attack on a Las Vegas gay couple in November as a hate crime. Suspects Kealan Abraham, 34, and Andre W. Duncan, 39, have had a hate crime enhancement added to their battery charges. If convicted, the enhancement means a longer sentence. In addition to the hate crime charges, the two face charges of battery with a deadly weapon resulting in substantial bodily harm, as well as conspiracy to commit battery. The attack occurred outside the couple’s apartment. 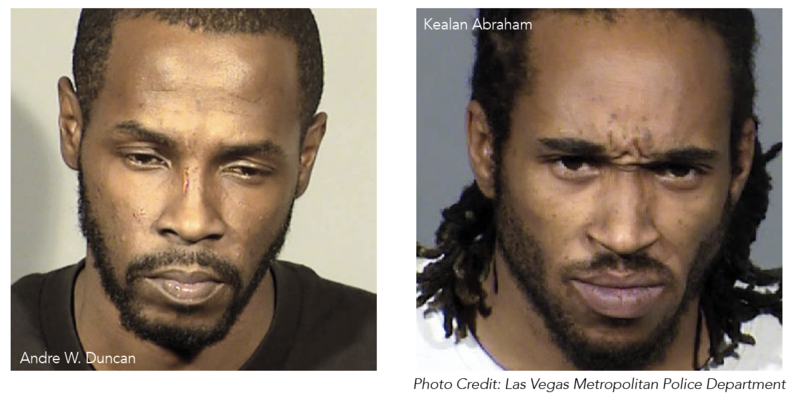 Their names were redacted in the arrest report, but detectives concluded they “were verbally attacked regarding their sexual orientation during the battery,” reports the Las Vegas Review-Journal. The battery happened on Nov. 29 as the couple was arriving home on the 1900 block of Simmons Street, near Rancho and Vegas drives. One of the victims was thrown onto a glass table during the fight, at which point, according to the report, Duncan picked up a piece of broken glass and began stabbing the victims. The couple’s injuries included broken ribs, a punctured lung, numerous lacerations and puncture wounds, the report stated. However, the suspects and one of the victims already knew each other before the attack. At one point, they all worked at a single Walmart location, where issues began several weeks prior. Abraham and the victim are reported to have had a verbal altercation while on the same shift, which included Abraham allegedly calling him an ‘abomination,’ this “because of his sexual orientation and the fact that the suspect knew that he had a boyfriend,” claims the report. Walmart was aware of the alleged comments and moved Abraham to the graveyard shift to separate the two. During that same argument, Abraham also allegedly used a derogatory word to refer to gay people in saying he “wants to kill” homosexuals, according to the report.